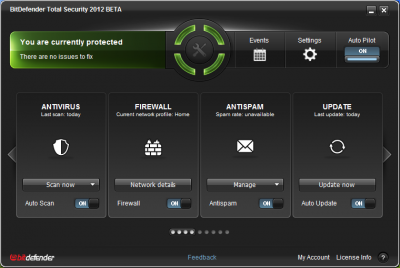 Download BitDefender internet Total Security 2012 Beta. With the new Features bitdefender total security 2012 was released them like autopilot, rescue mode, scan dispatcher, file sync and integrated cloud service., And you Can Download BitDefender Total Security 2012 Beta can be downloaded here. 1.Auto Pilot: provides a hassle-free experience by making optimal security-related decisions without input from you. 2.Scan Dispatcher: finds and uses time-slices when system resource usage falls below a certain threshold. 3.Rescue Mode: to clean and restore e-threats that cannot be removed from within the Windows operating system. 4.Online Backup (Improve features): BitDefender Total Security comes with 2GB of free storage to monitor and backup your important files. 5.Streamlined installation (Improve features): the new BitDefender 2012 requires half of time installation compares with the previous version. 6.Integrated Cloud services: the real-time, global interchange of data between BitDefender servers in the cloud and BitDefender 2012 products. 7.Social Networking protection (Improve features): prevents social-networking specific e-threats, monitoring your privacy settings, and much more. 8.File Sync: easily synchronize files between your PCs (such as your desktop and laptop). 9.Flexible interface(Improve features): provides drag and drop modules to get quick access from the main window.